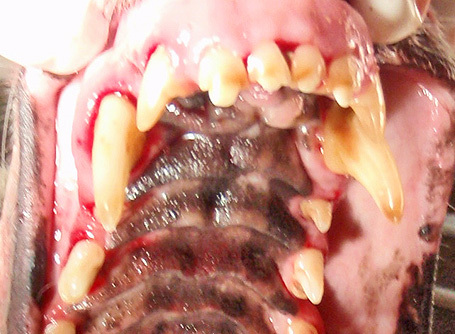 If your greyhound has significant root exposure on its incisors, it can be ever so uncomfortable for your dog. Those teeth with significant root exposure will build up plaque and tarter, may become loose, and may truly need to come out. 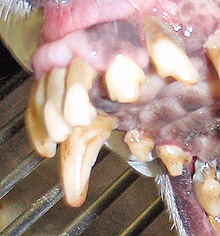 The sample photo shows a picture of at least four incisors that need to be removed. You can see the teeth below are significantly worn down. 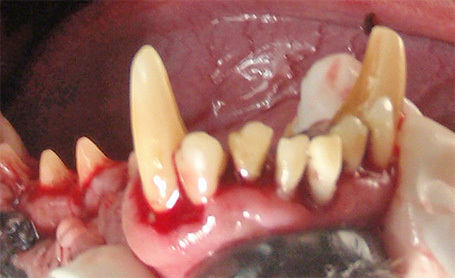 We could certainly apply bonding caps to cover the small pieces of tooth that are exposed, but those teeth do not cause significant problems for your dog because most of the actual tooth is gone. Capping the tips with bonding material will insulate them from sensitivity. Pulling incisors when there is not significant root exposure can become an ordeal and, unless it is apparent that they are bothering the dog, those teeth we just leave alone.